For the statement given below, mark the part of the statement that contains an error. If there is no error mark choice d.
think to plough a lonely furrow. Meaning of the phrase-: Follow a course of action in which one is isolated or in which one can act independently. Choose the appropriate option to fill in the following sentence. The plane _______ by the time we arrive at the airport in this slow traffic. 'will have landed' is Future Perfect Tense. Future Perfect Tense is used in those sentences where we need to explain an event or activity that will be completed in future by certain time. Those sentences where time expressions like - by the time(as given in this question), by then, by any date or by any year are used , we use Future Perfect Tense to explain the event. Call the doctor at once. Select the appropriate Passive voice for the above sentence. Doctor be called at once. Let the doctor be called at once. Let us call the doctor at once. At once the doctor be called. whenever we are given any imperative sentence, to change it to passive voice we use 'LET' as - Let + Object + Be/Get + Past Participle. i.e. Let + the doctor + be + called at once . Imperative sentences are those sentences that shows command, request, advice or instruction. It typically begins with a verb. As in the given Question - "Call the doctor at once". P and Q can do a work in 30 and 60 days respectively. They agreed to work together and finish the work for 1000 Rupees. But they worked only for 10 days. How much money should they together get ? one day combined work of P and Q= 1/30+1/60 = 1/20. Thus P and Q can finish the work together in 20 days. But they have worked only for 10 days which means they have finished half of the job. in base 10 we know 6+2= 8 but in this question it is given 1 so we have to find the base of these numbers. Now let the base be x so 6+2=8 -x= 1 thus base =7 (because in base 7, 8 will be represented as 1 carry and 1 addition ). 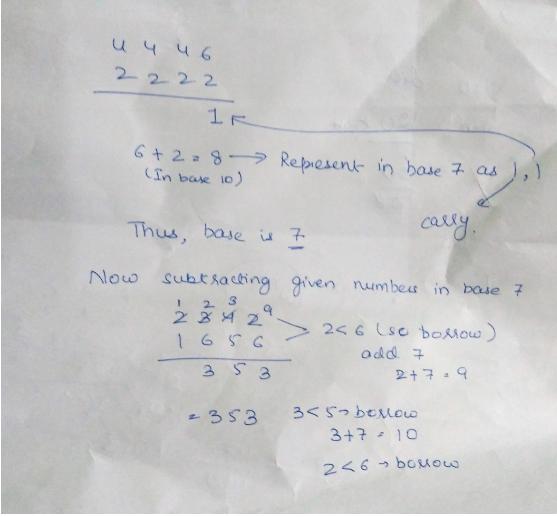 Now subtracting given numbers in base 7. ‘A’ sells a DVD to ‘B’ at a gain of 17% and ‘B’ then sells it to ‘C’ at a loss of 25%. If 'C' pays Rupees 1053 to ‘B’. then what is the cost price of the DVD to ‘A’ ? SP price of A = 117x/100. Four different pens (1, 2, 3, 4) are to be distributed at random in four pen stands marked as 1, 2, 3, 4. What is the probability that none of the pen occupies the place corresponding to its number ? here total cases will be 4!= 24. Just like that fixing pen 3 and 4 at A will produce 3 cases each. Therefore total favourable cases will be 9. 9, 7, 12, 12, 15, 17, 18, 22, ? There are two series present in this above pattern at alternate positions.